When the dust settles at the end of this year’s BCS National Championship Game in Glendale, AZ next month, the folks at University of Phoenix Stadium may need new lights for the score board. That’s because the two offenses that will take the field on January 10th both know a thing or two about scoring touchdowns. Oregon leads the nation with just under 50 points per game, while Auburn checks in at #6 with just under 43 points per game. The BCS Title Game will feature two players who will be in New York for this weekend’s Heisman Trophy ceremony. Oregon running back LaMichael James is averaging over 150 yards rushing per game, which leads the nation, while Auburn quarterback Cameron Newton, who is the Heisman front-runner, has added over 300 total yards per game, which is good for tenth best in the country. In this edition of College FootBlog, we provide the first of a three-part break down of the title game and a few of things to keep an eye out for in what should be a great match up next month. 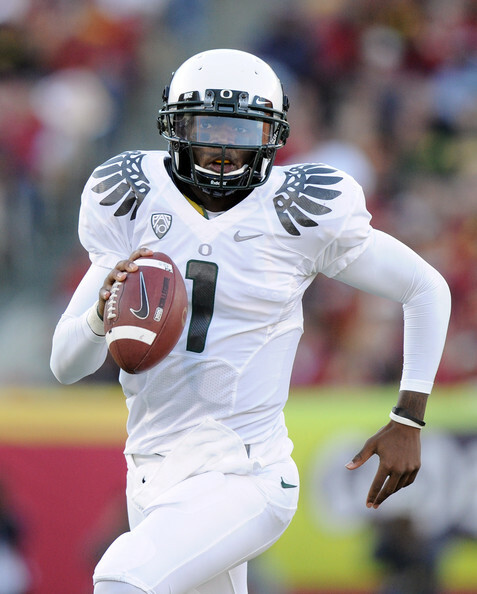 Oregon: Despite sharing the backfield with a Heisman candidate, the success of Oregon in this game will depend on the play of quarterback Darron Thomas. The sophomore QB has thrown for over 2,500 yards and 25 TDs and has an added just under 500 yards and five TDs on the ground. After Jeremiah Masoli was dismissed from the team last spring, there was concern that the Ducks would underachieve at the quarterback position, but all Thomas quickly put those doubts to rest and has led the most explosive offensive attack in the NCAA this season. Look for Thomas to continue to pile up more numbers against an Auburn defense that ranks 52nd in total defense nationally. Auburn: It doesn’t take an analyst to figure that the Tigers will live and die with the play of Newton at QB. As the season has gone on, Newton has risen to the challenge. It seems that the more Newton has been in the spot light (for his performance and amid the allegations stemming from his father’s “pay to play” investigation, which includes the NCAA and the FBI), his play has only gotten better. The bigger the stage and the more at stake, the more Newton seems to put the Tigers on his back and dominate against the best competition the country has to offer. He will be on the biggest stage of all next month, and expect him to deliver once again against Oregon’s 25th ranked defense. With only six weeks remaining in the college football season, College FootBlog takes a look at who is making the strongest cases to make the trip to New York for the Heisman ceremony. Here are the four elite players we feel have the best shot at bringing home the hardware this December. Cameron Newton (QB/Auburn): When you’re leading your team in rushing as a quarterback and your team is ranked #1 in the country, you’re making a very strong case for the Hesiman. Newton’s numbers have been sick this season, averaging over 305 yards per game with 27 total touchdowns. He will get at least one more chance to shine on national television when he leads his Tigers into Tuscaloosa to face Alabama in the Iron Bowl. A strong performance against Nick Saban’s defense would essentially lock up the Heisman and an SEC Championship game. LaMichael James (RB/Oregon): After missing the opener due to a suspension, many writers had removed the talented running back from their Heisman watch lists. But James has burst back onto the scene and currently leads the nation in rushing yards per game with 161. If Oregon keeps winning and James keeps getting his touches, he could be the fourth straight sophomore to win the coveted award. Kellen Moore (QB/Boise State): Once again, BSU’s quarterback has quietly put together the most efficient passing attack in the NCAA. The junior signal caller has thrown for over 1,500 yards and 16 touchdowns, with only one interception. With six more games remaining, he could end up with video game statistics again this year, and his Broncos have their best chance ever at playing for the BCS Title. If his stats hold up (and based on his career, they should) and if BSU can secure a BCS Title game, Moore will have as good of a shot as anyone at winning the Trophy. Justin Blackmon (WR/Oklahoma State): Dez Who? Blackmon has ripped through secondaries all season long for the 6-1 Cowboys and leads the nation with 158.9 yards per game. In last weekend’s shoot out with Nebraska, the sophomore wideout eclipsed the 1,000 yard mark to go along with 14 TD receptions. If he keeps this pace, he would finish the season with 1906 yards and 24 touchdowns–numbers that should lock him up for a trip to New York. OSU has a tough road to finish the season, with games against Texas and Oklahoma, so keeping that pace will not be an easy task. Look for another breakdown in a few weeks that will provide our pick for the top three, along with who College FootBlog thinks will ultimately bring the award home. In the preseason, College FootBlog put a list together of Heisman candidates and five Heisman Dark Horses. Just two weeks into the 2010 season, a couple of those players have lost a lot of momentum, and as is the case every season, there are others who have played their way onto the Watch List. In this edition of College FootBlog, we take a look at five players who have increased their stock and five more who could be on the outside looking in, based on where things stand after week 2. Terrelle Pryor (QB/Ohio State): Pryor had a big week against Miami last weekend, and that may have him as the candidate to beat. He will still have a couple of big tests against Iowa and Wisconsin. Solid performances in those two games could easily seal the deal for the junior QB. 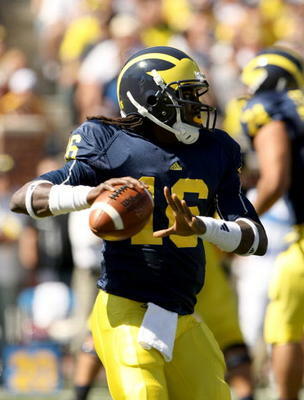 Denard Robinson (QB/Michigan): Many were surprised to see Robinson take the starting job away from Tate Forcier, but after his second huge game last weekend against rival Notre Dame, the sophomore quarterback leads the nation in total offense with a staggering 442 yards per game. If he can continue to rack up wins for Michigan, and if he can generate big yardage against Ohio State to end the season, he could be the next sophomore to bring home the prestigious award. Ryan Mallett (QB/Arkansas): Mallett has thrown for a little 701 yards and six TDs in the first two games of the season, but his true test(s) will come when he is in the thick of SEC play. His fourth game of the season against Alabama will likely determine whether or not Mallett stays on this list. Kellen Moore (QB/Boise State): The Broncos took a week off after the win against Virginia Tech. Despite leading his team to a fourth quarter comeback victory, Moore’s Heisman hopes and BSU’s hopes for a BCS National Championship took a huge blow when Va Tech lost to James Madison last weekend. Oregon State’s opening week loss to TCU also hurt Moore’s chance to play in front of a national audience. John Clay (RB/Wisconsin): The bruising running back has been solid so far this season, rushing for 260 yards and four TDs. As we mentioned in our Heisman Dark Horse article, his true test will come in back-to-back weeks, when the Badgers host Ohio State (Oct. 16) and Iowa (Oct. 23). Mark Ingram (RB/Alabama): The reigning Heisman winner already had the odds against him before the season started because he shares the backfield with teammate Trent Richardson. A knee injury later, and Ingram is effectively out of the race because he has been held out of the first two games. Christian Ponder (QB/Florida State): We had him listed as a dark horse candidate, but Ponder received a lot of media attention after he was named the ACC’s Preseason Offensive Player of the Year. Last weekend was catastrophic to his chances of making the trip to New York, Oklahoma entered the game with something to prove after struggling against Utah State. Ponder was held to 113 yards passing and two interceptions against the Sooners. Quizz Rodgers (RB/Oregon State): Week 1’s loss to TCU hurt the electric running back’s chances, as he only managed 75 yards rushing. A couple big games could get him back in the hunt because he did not play poorly and managed to find the end zone. Dion Lewis (RB/Pitt): Like Rodgers, Lewis had a rough week one, losing to Utah. And like Rodgers, Pitt’s explosive back only managed 75 yards and a touchdown in week one. He will get a couple more shots to throw his hat back in the ring, when Pitt takes on Miami and Notre Dame in the next few weeks, but after the Utah game, he has some catching up to do. Jake Locker (QB/Washington): Although his stats have been great (555 yards passing and five TDs through the air and another touchdown on the ground), Locker’s team will have to finish with at least a .500 record for him to get any support from the voters. The Huskies lost their opener against BYU and must take on Nebraska next, where they are 4 point underdogs. In the fifth and final breakdown of our Heisman Dark Horse Candidates, College FootBlog takes a look at our last impact player who is not getting the Heisman hype of the usual suspects–Mark Ingram, Terrelle Pryor, Jacquizz Rodgers, etc. In case you missed it, we covered Florida State’s Christian Ponder, West Virginia’s Noel Devine, Miami’s Jacory Harris and Wisconsin’s John Clay in our previous four dark horse articles. Here’s a question for all of you college football buffs–Which Heisman finalist from last season finished third in the nation in total yards with the following stats: 3,579 yards passing with 30 TDs and only eight INTs, with another 506 yards rushing with eight more TDs rushing…..no, it wasn’t Colt McCoy….not Tim Tebow, either. In our final edition of 2010’s Heisman Dark Horses, we take a look at why Johnson is still not getting the hype this season, and more importantly, what needs to happen for him to get some love from Heisman voters this fall. Johnson Needs at Least Two Signature Wins in 2010: Despite shredding one of the most dominant defenses in the nation (Texas), last season, the Longhorns ultimately prevailed in a 49-39 shootout at College Station last season. Two weeks before that, Johnson was stifled by a dominant Oklahoma defense that held him to 115 total yards, as the Sooners thrashed the Aggies 65-10. Johnson will get his shot at redemption against both OU and Texas, and he will also get a shot at yet another top-tier defense when Nebraska comes to town on November 20th. If he wants to be taken seriously, he must perform in all three games, and really needs to lead his team to victory in two of them. Will it happen? Unless the Aggies’ defense improves tremendously, it won’t happen. Despite getting the Sooners and Huskers at home this season, there are no real signs of significant improvement in a defense that gave up 33.5 points per game last season. A&M finished 105th in the nation in total defense, so there is really nowhere to go but up, but in an offensive conference like the Big 12, first-year defensive coordinator Tim DeRuyter will have his hands full. Unless the Aggies can produce an average defense, they will be a .500 team again this fall, and by all indications, that’s what they will be. Unfortunately for Johnson, quarterbacking a .500 team will leave him at home again in 2010, instead of making the trip to New York. On the flip side, if DeRuyter can work his magic and keep A&M in the game against OU, Texas and Nebraska, it will not only give the Aggies a chance to win, but it will give Johnson an opportunity to lead his team to huge, upset victories, which will only bolster his chance at a Heisman Trophy. Johnson Must Put Up the Same Stats as Last Year, If Not Better: If Johnson can match or break his 4,000 total yards he put up in 2009, that will force Heisman voters to keep him on their radar. If those numbers drop, it will effectively kill his Heisman hopes because winning the Big 12 South will be next to impossible for the Aggies to pull off in 2010. Even though OU and Texas must replace key contributors from the 2010 roster, each program has loaded up in recruiting for the last several years, and each team will make a case for a Big 12 Championship, which will likely leave A&M on the outside looking in when the dust settles in December. If Johnson can maintain the pace he had last season, facing three of the top defenses in the nation, he deserves to be a Heisman finalist. Will it happen? His overall numbers should be very close to the 2009 stats. How much better or worse they will be depends on how he performs against the big three Big 12 opponents mentioned above. Despite the difficulty of facing Nebraska, Oklahoma and Texas, the rest of the 2010 opponents aren’t exactly defensive juggernauts–the Aggies open with FCS opponent Stephen F. Austin and the out of the other remaining opponents, six of them finished 60th or worse in total defense last season, including 119th ranked FIU on September 18th. Look for the A&M coaching staff to leave Johnson in for the long-haul against the inferior defenses to help pad his stats this year for two reasons: 1) Having a Heisman hype around Johnson will bring some much-needed attention to a program that consistently loses recruiting battles against intra-division foes OU and Texas and 2) The coaching staff is well-aware that touchdowns could be hard to come by in the NU, OU and Texas games, so Johnson will need to rack up as much as he can against the weaker defenses. Given the weak out of conference schedule and the likelihood that Johnson should put up arcade numbers against those defenses, A&M just needs to get upset victories against Nebraska (which would not be a shock at all) and either Texas or OU, which could happen, but not with last year’s defense. College FootBlog wants your feedback. Who else deserves to be on our list and why? In Part 4 of our Heisman Dark Horse candidates, College FootBlog takes a look at Wisconsin running back John Clay. In case you missed it, we have highlighted three other dark horse candidates, Florida State QB Christian Ponder (see link), West Virginia RB Noel Devine (see link) and Miami QB Jacory Harris (see link). Each of these candidates has two things in common–they have put up big numbers last season, they appear to be poised for an even bigger season in 2010, and finally, the major media outlets are not giving any of them the attention that the bigger names like Mark Ingram or Terrelle Pryor are receiving. Wisconsin’s punishing running back John Clay certainly qualifies for this criteria. 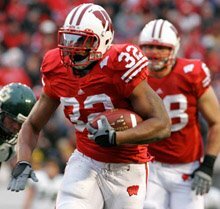 Despite entering the 2010 season as the reigning Big Ten Offensive Player of the Year and rushing for over 1,500 yards and 18 touchdowns in 2009. Two other factors point to even bigger numbers in 2010, with the emphasis on “BIG.” Clay enters two-a-days a few pounds heavier, as he is reportedly tipping the scales at 255 lbs., versus the high 240’s that he played at last season. The other key factor that will only help Clay’s quest to become the third Heisman Trophy winner in Wisconsin history is the stacked offensive line. Senior LT Gabe Carimi anchors an O-line that returns all five starters from a season ago that averages 6’5″ and 325 lbs. In order to be in a position to get the invite to New York a couple of key factors must work in Clay’s favor. College FootBlog uncovers these factors and breaks down the likelihood that Clay will be in the running for the coveted award at season’s end. Clay Must Get His Carries Against the Weak Teams: The Badgers again have somewhat of a laughable non-conference schedule, with only Arizona State as a decent opponent. The other games are against UNLV, San Jose State and Austin Peay. In last year’s soft schedule, Clay only carried the ball 15 times against Northern Illinois and just 12 carries against lowly Wofford. In the Wofford game, Clay rushed for 70 yards on those limited carries, but could have gone for much, much more, and he left the game without scoring a touchdown when the Badgers took full control over the game. Will It Happen? Yes, but head coach Bret Bielema will have the difficult task of balancing stats vs. risk of injury this season, but even though Clay is not as much on the national scene as he should be, he is recognized in the Big Ten as a legitimate threat for the Heisman. Bielema knows that more carries (particularly against weaker opponents) will get Clay closer to 2,000 yards and 20 touchdowns, which would force the Heisman voters’ hands when they turn in their ballots. Look for Clay to get a minimum of 20 touches against each opponent this season, regardless of the score. Clay Must Show Up in Conference Showdowns: Clay’s numbers would have been even more impressive, and perhaps the national media would be much more on board with his Heisman run this fall, if he had produced against conference foes Ohio State and Iowa. In 2009, the bruising running back only managed 134 yards and zero TDs combined against the Buckeyes and Hawkeyes, while averaging under 3.3 yards per carry. Once again in 2010, Clay will go against OSU and Iowa in back-to-back weeks, and each game has a great shot at being nationally televised. If he can eclipse the century mark in yards in each of those teams, who will each have dominant defenses again this fall, he will be on everyone’s radar. If he is neutralized in either (or both games like last year), he can probably kiss the Heisman goodbye. Will It Happen? The numbers should improve, and he will likely go for 100+ yards in at least one of those games. We also believe that behind that massive offensive line, he will get into the end zone at least once in each game. If he does rush for 100+ yards in one game and if he can get to 75-80 yards in the other game plus a couple of TDs, he will be right in the thick of the Heisman talk. Getting 100+ yards against two of the best run defenses in the country two weeks in a row is a tall order for any running back and O-line combination, and the odds will be against Clay again this season. If Clay can get more carries, especially against the weak opponents on his schedule, and if he can go for 100 yards against Iowa and/or Ohio State, don’t be surprised if the Big Ten finally endorses him–he wasn’t even voted as the preseason offensive player of the year, despite winning the award last season–and the voters will take notice as well. Look for College FootBlog’s fifth and final Heisman Dark Horse Candidate later this week. In part three of our Heisman Dark Horse candidates, we take a look at Miami quarterback Jacory Harris. In case you missed them, we featured Florida State’s Christian Ponder in our first article (see link) and West Virginia running back Noel Devine in our second article (see link). After splitting snaps with Robert Marve as a freshman, Harris took the reigns last season exclusively. And the then-sophomore QB didn’t disappoint. When the dust settled, Harris led the ACC with 3,352 yards passing. 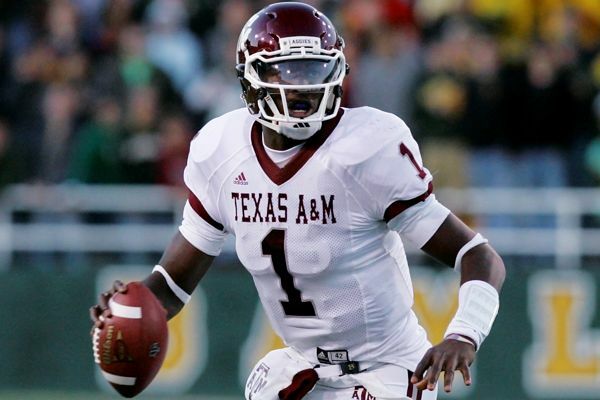 In order for Harris to have a legitimate shot at the Heisman, at least two things must happen in 2010. College FootBlog takes an in-depth look at these items and analyzes Harris’ chances of punching a plane ticket to New York this December. Many of those picks were due to poor decisions and/or bad reads. Other picks were caused by pressure up the middle that did not allow Harris to properly step into his throws, which caused the ball to float, giving the defensive backs time to adjust and attack the ball at its highest point. He must improve this if he wants to show up on anyone’s Heisman radar this fall. Will it happen? It should. With a full year under his belt and home games against Virginia Tech and North Carolina (two games Harris really struggled) and an off-season to study film can only help him. An injured thumb on his throwing hand didn’t help Harris last year, either. Harris had surgery on that thumb and appears to be ready to go for two-a-days, and because he was not able to throw this spring, he spent his time in film study, which should improve his decisions and reads this fall. Harris must shine in his nationally televised games: This point directly ties into the previous one–decision-making. Harris will lead his team into some of the most hostile stadiums in the country this year, traveling to Columbus to take on the Ohio State Buckeyes and they travel to Death Valley to take on Clemson, who Harris struggled against last season. Each of those games has a great shot at national coverage, and the annual rivalry games against Florida State and Virginia Tech will likely be opportunities for Harris and the ‘Canes to play in front of a national audience. If North Carolina continues where they left off last season, there is a chance for yet another nationally televised game against the Tar Heals as well. Big performances in those games would go a long way in impressing Heisman voters who are not in the southeastern United States. Will it happen? Probably, but how much he improves is debatable. What should concern ‘Canes fans is that ten of his 17 Int’s came against the good defenses he faced. Miami played five games against defenses that ranked in the Top 20 in the country, and there was only one of those games (Wisconsin) that Harris made it through the game without throwing the ball to the wrong-colored jersey. The Hurricanes will again have to face top-tier defenses in 2010, and that includes trips to Ohio State (ranked #5 in total defense in 2009) and Pitt (ranked #23 in total defense in 2009). They get North Carolina and rivals Florida State and Virginia Tech at home, but they travel to Death Valley to take on a Clemson defense that roughed Harris up several quarterbacks last year.